On Christmas Eve, 1913, 73 people died in a stampede after a false cry of Fire! at a children's Christmas party in northern Michigan. There was no fire and the event marked the turning point in a bitter labor dispute in a large mining community. Two questions always arise: How could such a thing happen and why has this story not been more widely told in the past 101 years? The northernmost part of Michigan's Upper Peninsula is known as the Copper Country, after its thriving copper mines which led the world in production at the turn into the 20th century. While the mines wallowed in profits, workers – mostly recent immigrants – made a few dollars a day and had few rights. The Western Federation of Miners organized and gained enough membership to call a strike in the summer of 1913. They struck when the mines refused to collectively bargain and the mines shut down when the miners walked off the job. The mines refused to negotiate. Outside forces tried to get the parties to settle but mine management held the position that talking with the union meant recognizing it. To shore up their position, the mines brought in strike breakers. These men worked for agencies that specialized in busting heads and breaking up pickets and soon there was violence in the region. A boardinghouse in a town called Seeberville was shot up in broad daylight by some of these strike breakers and two strikers were killed. The victims were unarmed and the shooting was unprovoked. Although the gunmen would face prosecution later, the sheriff helped them evade justice by spiriting them out of the county and putting them in a safe house. Such was the way justice worked in the Copper Country in 1913. By Christmas, the strike had dragged for months with no end in sight. Union benefits were sparse at best and the season promised little by way of cheer. The women's auxiliary of the WFM decided to throw a party on Christmas Eve for the children of the strikers. It would be held in a well-known union gathering place, the Italian Hall. 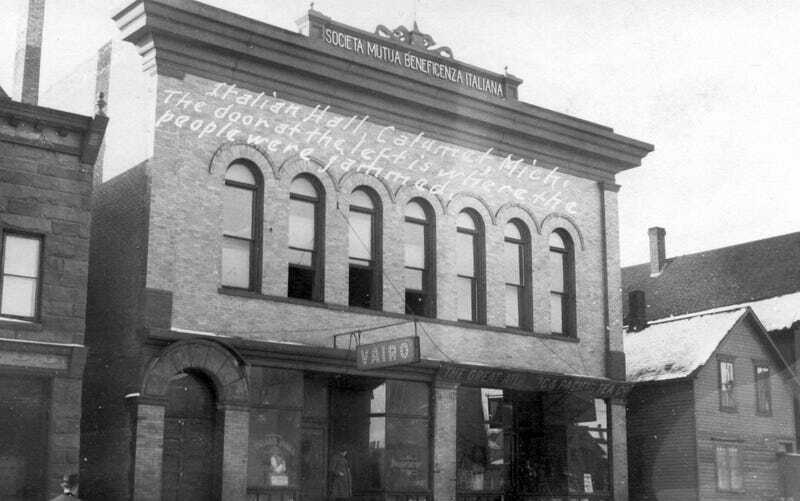 The Italian Hall was a two-story building with a saloon and general store on the first floor and a large gathering place with a stage on the second. To reach the top floor, visitors had to climb a tall, single flight of stairs which covered a rise of 14 feet. Parents and their children began arriving the afternoon of Christmas Eve and soon the upper floor was crowded. Perhaps 700 people were in the hall at the peak of the party. Songs were sung and presents were given to the children by Santa who sat on stage next to a meager Christmas tree. Then, a man entered the building, climbed the stairs and stepped into the main room. He yelled "Fire!" twice, at the top of his lungs twice, in English. He then turned and as panic set in behind him, he ran away. There was no fire but there was an instant panic. Masses swarmed toward the exit at the top of the stairs, pushing and shoving to escape the onrush of people from the hall. Someone tripped and fell on the stairs and more people pushed from behind. More people fell. Soon, there was a pile on the stairs of a hundred or more people, mostly children. The commotion inside the building attracted attention on the street and someone called the volunteer fire department. They arrived quickly and soon realized it was not a fire they were dealing with, but a stampede and crush on the stairway. They entered the building through a fire escape and began trying to rescue those on the stairs. Some they could save. 73 could not be saved. The number of deaths overwhelmed the community. The victims were taken to a temporary morgue and soon plans needed to be made for a massive number of burials. Undertakers ran out of caskets and had to appeal to nearby communities for more, particularly children's caskets. The union president sent a telegram to the governor, asking for an official investigation into the tragedy. When word got out that he had done that, a group of men - probably working with the sheriff - beat, shot and kidnapped him. They threw him on a train and told him he would be killed if he ever returned to the area. Services were held at several churches and then the local cemetery where many of the victims were placed in mass graves which are unmarked to this day. At graveside, a union speaker – responding to criticism of the union for rejecting charity offered by the mines – said, "It is not charity we want; it is justice." But who was at fault? Rumors swirled that the man who had raised the cry had been a strike breaker and had been wearing a button which identified him as an ally of the mines. The sheriff – the same one who helped the Seeberville murderers hide after their crime – half-heartedly investigated and then decided to let the coroner take over. This was an interesting decision because the coroner's only job was to assign a cause of death. Everyone knew how the victims died. It would have made more sense to arrest the man who cried Fire and put him on trial. The strike petered out in 1914. The Italian Hall had been the turning point in the minds of many. How could one soldier on after seeing such devastation? Among the 73 dead were 60 children. Three families lost three siblings each. Mothers and fathers perished while children lived. Everyone in town had either lost someone or knew someone who had been lost. Families pulled together but they could not stay out on strike any longer. The strikers tore up their union cards and decided it was more important to live and fight another day. When it happened, the Italian Hall disaster was big news. It was on the front page of the New York Times. Just a few years later, Oliver Wendell Holmes conjured the image of falsely crying Fire in a theater and was most likely referring to the Italian Hall. In Calumet, the town where the Italian Hall stood, the tragedy is well known even though no one remains alive today who was there that night. The Hall itself was torn down in 1984. A park remains, with the arch from the Hall and a historical marker. Every Christmas Eve locals place candles on the site and a few gather to remember the event. In recent years, the Italian Hall disaster has been getting a little more attention. PBS broadcast a documentary last year called Red Metal which told the story in the context of the strike. It still is not mentioned in most history books, not even those used in Michigan. Perhaps that will change some day. It is a story of Michigan and of labor. But most of all, it is simply a story of human tragedy. On this Christmas Eve it would be appropriate to reflect for a moment on the Italian Hall. It must never be forgotten. Steve Lehto is an attorney and writer and wrote, Death's Door: The Truth Behind the Italian Hall Disaster and the Strike of 1913. He was also historical consultant on Red Metal: The Copper Country Strike of 1913, which aired on PBS.